Hello guys, today and as always we are going to solve a problem with the latest Microsoft Windows 10 which seem to be a pain in the neck for many users. First, it may interest you to know that the new Microsoft Windows 10 operating system has no option to create guest accounts from the control panel as we have it in earlier versions of Windows. Well this is a problem considering the fact that a recent study has shown that about 85% of attacks on Windows PCs around the world was a result of malicious software installed by “guests.” But in the real sense of it, a guest was not supposed to have full access to your PC. In the earlier versions of Windows, a “guest account” meant that the user had no permission to install software, change system settings and all that. Unfortunately though, if you had to share your PC with someone, Windows 10 hasn’t got that quick option to assign a guest account. 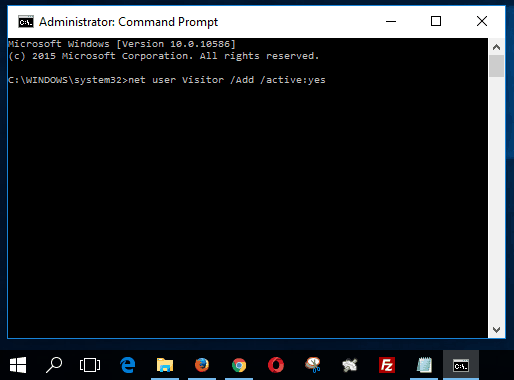 Doing a Google search on “how to create a guest account in Windows 10” will lead you to a lot of blogs that tried to do this via command prompt but their methods isn’t effective. So I will quickly show you a method that actually works. In the steps below, the idea is simply to create a regular user account and then assign it to the guest group. So the next time a friend asks to use your PC you can just give him or her the details of the user account we shall be creating and trust me, they won’t meddle with your things, at least not much! One more thing though, since “Guest” is a reserved account name in Windows, we’ll use “Visitor.” Got the twist? Good! Open the command prompt by Right-clicking on the Windows button and selecting Command Prompt (Admin). Click Yes when asked if you want to continue. will create a blank password for the account. This adds the Visitor user to the guests group, which is more restricted than local users. That’s it, the did has been done. You can now click the Windows button, click on your username then click on “Visitor” to try it out and see how you have managed to work around this. Kudos to you for enabling the guest account on Windows 10. Do not forget to share this with your buddies…. Very useful information that you shared. Now i can easily create guest account easily.